Warning: if you are looking for advice on how to increase your chances to be accepted in a university in Sweden, this is not your place. 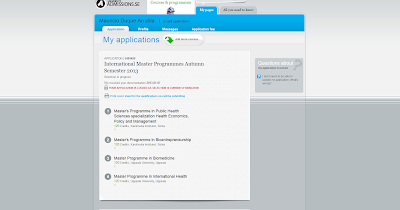 This long post only refers my experience on submitting applications to be accepted in master programs at a Swedish university by the centralized system in University Admission (UA) https://www.universityadmissions.se/ and how the process is from the applicant point of view. I applied for Master programs starting on Fall (autumn) 2012, Fall 2013 and standalone courses during spring 2013 semester (this was a late application). I will review my experiences on those three instances; put some screenshots from the last two and recall memories and some email from the first one. 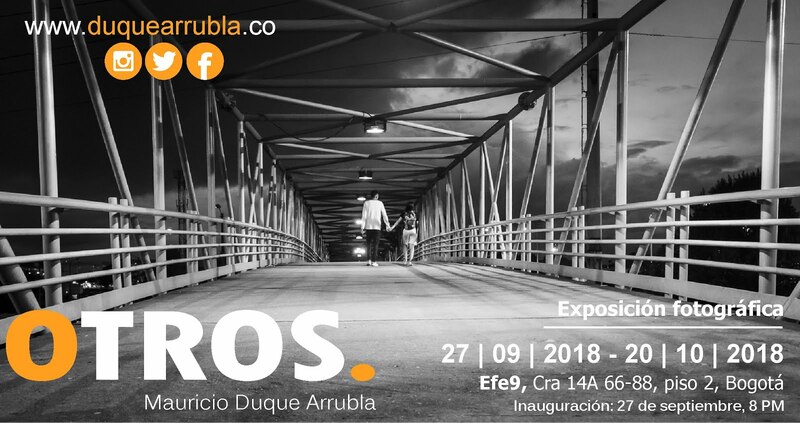 Tomorrow I will receive my results, In the meanwhile I share my experience in this blog. Application must be prepared with enough time in advance and you must be very clear of the deadlines and the times you will spend getting your documents in your country of origin and the time that certifications, translations and/or legalizations will take. Of course, it depends on your university and your country. Be prepared for the worst case scenario. For selection processes for masters starting in fall, applications opens by December and finishes in January. For courses or programs in other times of the year you can make the corresponding time conversions but consider at least 4 months. Accurate dates can be found in universityadmissions.com. I suggest to apply during early December as you will use the application number and will need to print a cover sheet to include in your supporting documents. So, as the mail with your package will take some time to arrive to Stroemsund, you must have that number and cover sheet with enough time before deadline. During my 2012 and 2013 applications there were two deadlines. 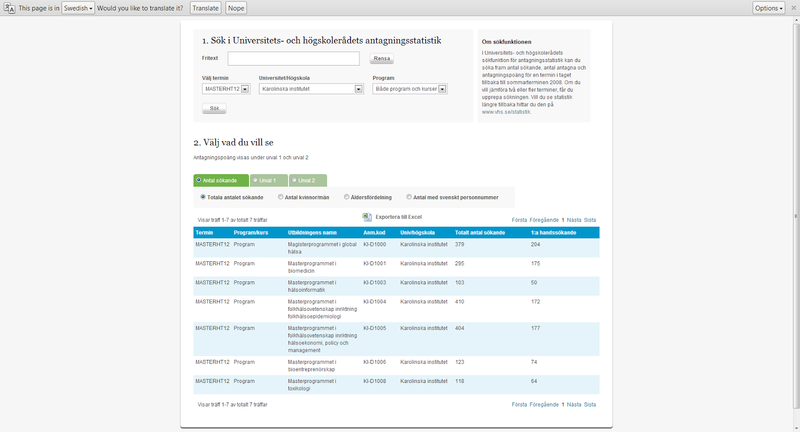 The first regards to applications on https://www.universityadmissions.se/and the second is about receiving payment and documents. Payment could be done by credit card and is charged immediately. Documents take more time. One of the reasons to plan your application with time is that some documents could take some weeks to be obtained. There are a number of common documents for all programs and universities and there are specific requirements form some universities and programs. So, you must check both the UA site and the pages of programs you are interested in. Important: if you will submit TOEFL results be informed that they take between 45 and 60 days to arrive to University Admissions in Sweden after you request ETS to send them (you cannot provide copy of your results by yourself). During the 2012 application, I requested my results very late, University Admissions told me that they are aware of those delays and they accept the results even in late February. But, for your own peace, send them during December or before. I do not know how long does it take to receive reports of other language tests. Be careful with the order of the documents. University Admissions and your university could request a specific order and it will be easy for them to qualify your competences if you help them to find the documents. There are some instructions about not binding documents, not use staples, etc. For your own good, follow those directions. If you send your documents by courier as FedEx or DHL it is possible you see that the package remains in Stockholm for some days or that it is forwarded to local operator and you lose tracking. University Admissions offices are located in a small town in the middle of Sweden, Stroemsund, and those companies do not deliver there by themselves. They use the very good Postal Service available in Sweden that takes only one day to transport and deliver the documents once they receive the package. So, do not be very afraid if DHL tracking system does not show updates after arriving to Stockholm. You must be checking your account in University Admissions as they will update your application with the date they receive the package, although you will see that update 2 or 3 working days after they actually receive it. If you send documents for a previous application those will be available for the following ones. Those very late TOEFL results are still valid and I did not need to resend them for the other two applications as they are in my documents folder (or whichever system UA uses to keep my documents). Once University Admissions has your documents the admission process starts. You must check your account at UA as they will use the messages tab to communicate any remark they find in your documents. It appears that the actual qualification process starts in March (I say this based on my experience and is not official information), so you could have some additional time to solve any remark. That was the case with my TOEFL results in my first application. You have had two months or more waiting any news about your application. As soon as the deadline for receiving documents passes, the status in your application will change to “in process”. They check the documents you send and begin to figure out if you are qualified for the Master program or not. You are still able to modify the order of priority in the programs you selected but be careful. This not happened to me but I read somewhere on the web that if you perform any change to your application after the deadline, it will be considered as a late application. So, ask for the University Admissions’ advice before any change. In my most recent case, I received the status Qualified very quickly, first days of March of 2013, for one of my options. But for the others three I had to wait until about a week before the results announcement date. So, do not be scared if you do not see any change. In all my applications I received the status Qualified for all masters of programs involved. If you receive the status Qualified means, as the UA page itself says, that you meet the minimum admission requirements. Now you are competing with other people more or less qualified tan you, but all qualified. My experience is that the selection process is very tough. 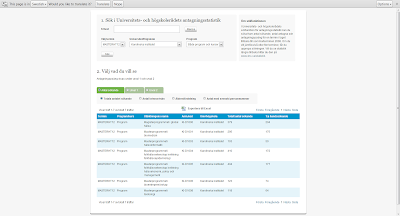 The Swedish Council for Higher Education manages a site where you can check statistics of previous selection processes: http://statistik.vhs.se/. It is in Swedish but, if you do not understand the language, Google solves you that problem. In that site you can see how many people applied for each program or course, how many of them are women or men, how many has Swedish ID number. But the most thrilling thing is that you can find the minimum admission points to your program in previous runs. This can bring hope and more anxiety or, for many of you, disappointment and frustration. But take in account that each case is different, each yearly selection also. If you are in status Qualified, please keep your hopes. 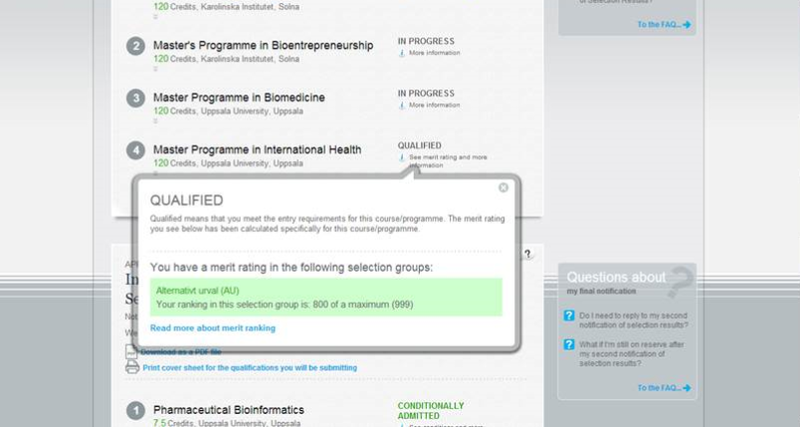 In my first application process (2012) my merit ranking for a program at Karolinska Intitutet was 7 / 20. It seemed, and it was, a low qualification, but, anyhow, I was placed in a waiting list after the first admission round. I saw this year that the minimum rating admitted in 2012 was 10, so I was not very far. The last days before selection announcement, the system locks your application and selection is run. The status of your programs disappear and even the messages feature is limited or disabled. This happens two or three days before the so expected date. Now, it is the day. Today will be published the results…. Actually they do not publish the results but tell you your own results. You cannot see other’s final decision. In 2012 they said that the results would be available at 1 PM on 16th of March. But even Swedish people, sometimes, cannot match the deadline. Two or three hours later I received an email telling that my results were available at UA site. If you have waited during 2 months or more, two hours is not a big deal (at least for people from countries where punctuality is not the most appreciated value, like mine). In 2013 they did not specified the hour at which the results will be communicated. You will see a new status for each one of the programs you chose. The ones I know are admitted and reserve. 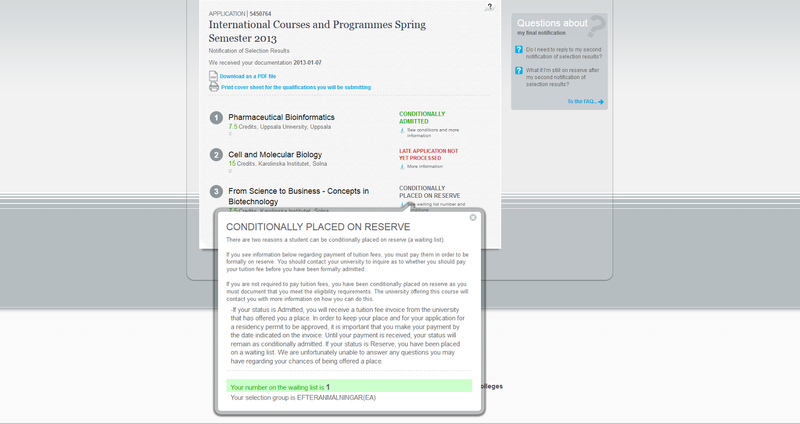 Actually, as I have to pay tuition fees, the status were conditionally admitted and conditionally placed on reserve. In the case when I was accepted, the condition is that I have to pay the fee before the registration at the university take place. This was for the stand alone courses during spring 2013 although, actually, the course was held from January to March. During the 2012 admission process for Masters starting in Fall, I was placed in waiting list for both programs I applied for at Karolinska. I did not apply for any other program or university. I was placed initially in number 19 for one program and number 15 for the other in the waiting lists. After the second admission round I reached the number 5 in both. 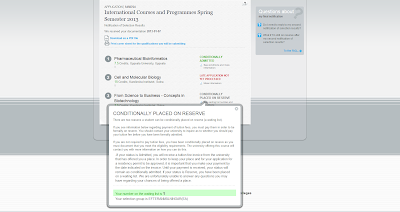 As UA says, I is not possible to guess changes to be accepted if you are in a waiting list. It depends of many variables, different for each university and program. But if you receive one of those admission status you MUST accept them in order to formalize that you are interested in that program you were accepted for or you are interest in participating in the second admission round. You can give your response the last day if you prefer. I understand that you can change your decision in the last moment before deadline is reached. The official notification is a PDF file you can download from your account in UA site. It is a letter where the first page and part of the second has general information you should read carefully. 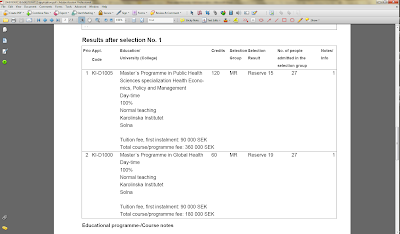 In the second page you will find the results for all the programs you applied for and after those additional directions. In this letter the status they state is actually Admitted or Placed on reserve even if you have to pay tuition fees. The second admission round is more of the same, you receive the email message and find the results in your UD account page. You do not have to respond this offer. If you were admitted and you accepted the offer from your University (you will receive only one offer even if you have merit ranking to be accepted in all your options) you will be contacted by email from your university. You will receive information about payment, registration, etc. Each university handles these communications in its own way. I made a late application for 2013 spring courses. I applied for three of them, two at Karolinska and one at Uppsala Univerity. For these standalone courses you can be admitted to more than one if you do not exceed certain amount of total credits. The deadline for application was September and I only applied in December. 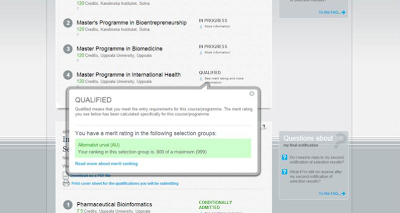 Uppsala University checked almost immediately my application and admitted me. This course was web based so I did not have to deal with visas or residence permits. I was admitted in December and the course started in mid-January. Other was the case with Karolinska. One of the courses I applied for started in January and Karolinska did not processed my late application. I asked KI admissions people and they confirmed that they will not process it. The other course started on 25 of March, 2013 and KI processed my application when processing the application for master programs: the week before the course started. I was placed in number 1 in the waiting list. Although if I had been accepted I could have not attended the course as the visa takes from 3 to 4 weeks in the best of the cases (and I was already committed with some consultancy clients). This was not Karolinska Institute’s fault. It was mine by applying so late. 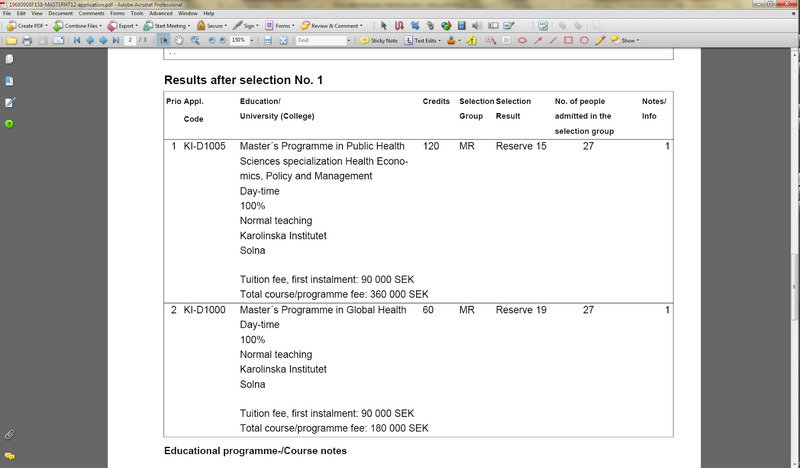 I was lucky that Uppsala accepted me and that the course was web based. So, even if you see that you can make a late application, don’t be so confident it will be processed on time. The University Admissions website has a lot of information and is very helpful. However you could need to make a specific question. You must use the contact option on the home page. Include all the information you consider is relevant (application number, course or program name, course or program code, your specific question or doubt, etc.). As soon as you send the question you will receive an automated email response. The system checks keywords on your query and respond with a pre-written answer. If it is unsuitable for you, you can request that a real person check your message. For that, you will find a link in the automated message. Clicking on it you will be brought to a very simple page, almost blank. But it means that your question was received. Wait a couple of days to receive your response. If you receive a message in your UA account you will be not able to answer it from that place. Use the feature described above if you need to clarify something on it. Hello my friend! I would like to tell you that this write-up is awesome, great written and include almost all important info. I recently came to know about http://dignosco.org/, their Admissions Advice are very effective. Very good and useful post, thank you. I was wondering if you have any idea about something else. I'm in the middle of the admission process. This morning, my application status has changed to "QUALIFIED" and they also mentioned my merit ranking and the selection group. A couple of hours later, they sent me an email to let me know all my documents are valid and correct and they accepted them. But in the afternoon, my application status has changed again, to "IN PROGRESS". Now I'm pretty confused. Does this new status mean that they changed their mind and there might be something wrong about my documents or my application or it's just the next step of the process. According to your personal experience during the admission/selection process, what do you think? Mauricio, thank you for writing back, I really appreciate it. I hope you will be right. Actually, last night (!) they changed my status again, back to "QUALIFIED", and they also mentioned the selection group according to the GMAT score. So I suppose they won't change anything anymore until the Notification of the selection results. God help me! Thank you once again for your time. And I wish you all the best!